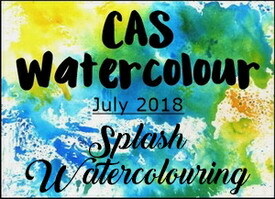 In honor of Nancy's last challenge as host, the technique at CAS Watercolour is Splash Watercolouring. The green panel, sun and arc behind the sun were created using Distress/Distress Oxide Inks in greens, yellows and pinks using Loll's Splash Watercolour Technique then die-cut. To add some interest a circle die-cut from the pink panel was offset behind the sun. Part of the sentiment was stamped with Versamark and heat embossed using white EP onto a die-cut piece of grey card stock. The rest of the sentiment was stamped using black hybrid ink. For dimension the sun was popped up using foam tape. A few clear sequins complete the card. Methods used: Water-colour Splash, die-cuts, stamping, heat embossing. What a pretty sunshine, Marilyn! It's so pretty against the splashed background! And you found the perfect sentiment! Thanks so much for sharing with us at CAS Mix Up and CAS Watercolour! This is beautiful Marilyn!! LOVE the colours of your splashed background paired with you bright sun. The sliver of pink in the background is awesome --- very creative! 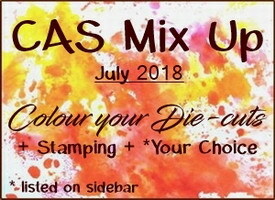 Thanks for sharing with us at CAS Watercolour and CAS Mix Up! Thank you also Marilyn for adding your beautiful colored die cut and Splash card to our CAS Mix Up Challenge too...Hugs..
Oh, this is lovely Marilyn! The shadow behind the bright sun was a great design idea, love the green/blue sky and sentiment strip in black! Thanks for playing along with the CAS Mix Up!